Service technician Tyler Pabst demonstrates the servicing of a geothermal unit in Norman Wednesday. 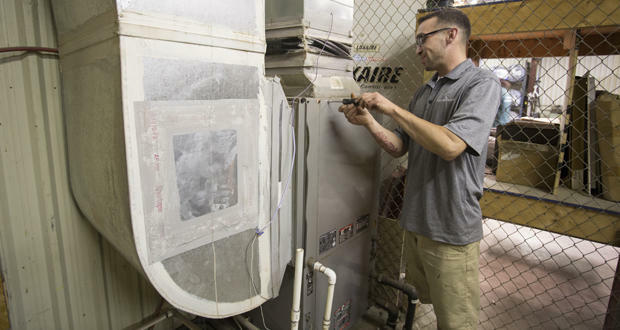 The end of a federal tax credit for homeowners who install Energy Star geothermal pumps has driven down business for Oklahoma companies that install the equipment. Comfortworks, Inc. has seen a decline in business between 20 to 30 percent since the credit ended in 2016. Chris Ellis, vice president for Comfortworks, Inc., told the Journal Record’s Kateleigh Mills that his company has begun to focus more on commercial sales since the residential credit ended. “It’s just a matter of keeping commercial going to help supplement a little of that business loss,” Ellis said. 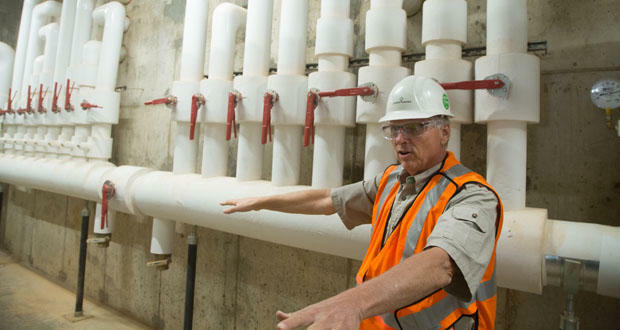 The Geothermal Exchange Organization is lobbying to renew the tax credits. A bill by Rep. Tom Reed, R-NY, would give a tax credit for fuel cells, the small wind energy industry and geothermal heat pumps. During his weekly conversation about business news in Oklahoma, Journal Record editor Ted Streuli said the retired tax credit was very attractive to homeowners. “The 30-percent credit, plus the energy cost savings, meant homeowners saved enough to pay for the system within three to five years,” Streuli said. The potential for savings allowed Comfortworks, Inc., and Geo-Enterprises in Catoosa to focus on homeowners. “For the last decade or so, it’s really mostly been residential, but the tax credit drove a lot of that business,” Streuil said. McCleland: Ted, these proposals will pick up where the MAPS 3 project left off. What are the priorities with these proposals? Streuli: The two proposals are really all about infrastructure, particularly road maintenance. Something like $500 million of the general obligation bond money -- that’s more than half of the GO bonds -- would go to streets, with some sidewalks and bike lanes. McCleland: The previous MAPS initiatives had signature projects, like the Bricktown Canal, or the baseball park, or the Chesapeake Energy Arena, and now the big downtown park and convention center. What’s the signature project for this new proposal? Streuli: There isn’t one. About a fourth of the sales tax would go to the city’s general fund for routine spending on things cities spend money on -- public safety, mass transit, animal control and so forth. And the rest would go toward transit infrastructure. McCleland: This proposal makes one-quarter, or one-fourth, of the sales tax permanent. That’s a change in how MAPS projects have worked in the past because previously, the entire one-cent sales tax would sunset, and voters would have a chance to approve a new MAPS package, or not to, to reject it if they chose so. Why are they converting one-fourth of the sales tax into a permanent tax? Streuli: Well they didn’t really say, but it seems to us that with sales tax revenue having been down for some time, and sales tax being the only real income for Oklahoma cities all over the state, so this looks like a maintenance package to make sure the city can finish the MAPS 3 projects and supplement their waning revenue. McCleland: Councilman Ed Shadid has been critical of the proposal. What are some of his criticisms? Streuli: He said the MAPS projects have transformed the city and set residents’ expectations well above minimum standards. So using the money for something as blase as filling potholes is going to be a disappointment for residents. McCleland: We mentioned that one-quarter of the one-cent sales tax, or one-percent sales tax, would be permanent. When would the other ¾ of the sales tax sunset? McCleland: I do want to switch gear to a story from Thursday’s paper about the decline in business for geothermal companies. What happened here? Why is business slumping? Streuli: A very attractive federal tax expired last year and without it, residential sales have fallen by a fourth. The 30-percent credit was plus the energy cost savings meant homeowners saved enough to pay for the system within three to five years. McCleland: Among the geothermal companies your paper talked to, do they expect federal tax credits to return sometime soon? Streuli: There’s a lot of lobbying going on right now for House Resolution 1090, and they’re hopeful the credit will be reinstated through 2021. But it’s a long way from being a done deal. It’s been in committee since mid February when it was introduced. McCleland: What are the companies your paper spoke, what are they doing to stay afloat with this decline in sales? Streuli: Mostly, they’ve shifted their focus from residential to commercial work. McCleland: So they’ve shifted from residential to commercial. What is the primary market for geothermal energy in Oklahoma anyway? Streuli: Well for the last decade or so, it’s really mostly been residential, but the tax credit drove a lot of that business. So with that business fading, commercial work has really become the mainstay. Several Oklahoma businesses are joining a national energy trade group to lobby Congress to extend tax credits for renewable energy. Representatives from the geothermal heat pump sector want an extension of tax credits that are set to expire in December. Members of the geothermal industry say extending the tax credit will allow their businesses to keep growing.